It's prefect addictive chewy cookie, one bite of these and you’ll go to heaven. It's fatty, but just can't stop eating. Last time I made 3 dozen, didn't even last a day! 1. Place 1 tablespoon of the flour into a small bowl. Chop each caramel into 6-8 pieces and lightly coat with the flour. Whisk together remaining flour, baking soda, baking powder and salt in a medium bowl. 2. In a large bowl, cream together butter and sugars until light, about 2 minutes. Add in eggs one at a time. Don't worry if the batter separates, just keep beating until it becomes smooth. 3. Stir in flour mixture, followed by caramels, chopped pecans and chocolate chunks/chips until batter is uniform and no streaks of flour remain. 4. Drop rounded tablespoonfuls onto the baking sheet. Cookies will spread, so allow at least 2 inches between each cookie. 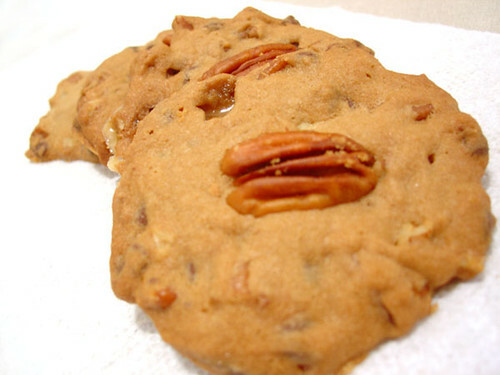 Put pecan halves on the top of each cookie. Press down a bit. 5. 350F Bake for 10-12 minutes, until cookies are lighlty browned around the edges. 6. Allow to cool on the cookie sheet for 5-10 minutes before removing to a wire rack to cool completely. If the cookies stick to the parchment, allow them to cool longer before moving them. 1/ Cookie can be stored in air-tight container at room temperature up to 5 days.